Navagio beach comes with a very spectacular scenery. Located on the island of Zakynthos, Greece. Beautiful landscape is often used as an image for the postcard and various promotional materials. This beach is known as Shipwreck Beach or The Shipwreck. Naming is due at the beach area there is a shipwreck believed to be named Panagiotis smuggler. 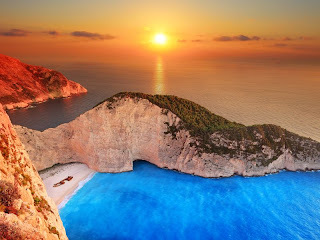 The presence of these ships made ​​the coast Navagio have another nickname, the Smugglers Cove Zakynthos. Not only the best beaches on the island of Zakynthos, Navagio also one of the trademark in Greece. Ship Panagiotis main attraction for tourists to visit the beach Navagio. Even where the beaches are in a very isolated island. Usually the British and Italians call it Zante. Navagio included as a place with the most beautiful bays in the world that comes to resemble the crystal clarity of water. The color of the water around the bay beach can be changed depending on the beam of sunlight. 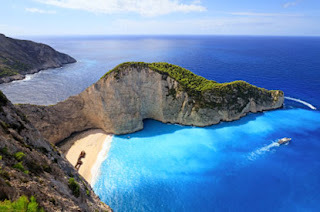 To reach the beach Navagio can use the boat from the city of Porto Vromi, Zakinthos, which directly leads to the beach. The boat comes every hour with a journey time of 30 minutes. During high season the beach will be filled with many visitors. To avoid the crowds you can come in the morning. Navagio beach beauty can be a pity if the object image was captured.